OCT is a non invasive procedure that scans the structure of your eye creating a comprehensive 3D image of the microscopic layers of your retina. The OCT imaging system takes a high resolution retinal image. It is a non contact, non invasive technique which scans the structures of the eye producing superb high definition cross sectional and three dimensional images. The test will take about 15 minutes. Our new state of the art Canon OCT-HS100 imaging system helps us provide the most accurate analysis of the health of your eyes. 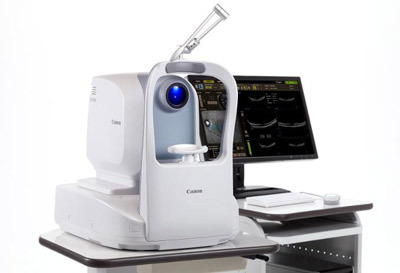 Our Canon OCT is the ultimate tool for diagnosis and monitoring of your macula, resulting in early detection of glaucoma, macular degeneration and many other retinal conditions.